Evernote: you know me and my love for Evernote. I use it for everything: capturing blog post ideas (Share to Evernote via Chrome plugin or mobile app), notes (email to Evernote is good for this one), wines (snap a pic of the label directly into Evernote), books, movies, recipes, drafting speaking notes, I mean, literally everything is in there. I usually use the mobile and web versions, but I logged into the desktop app this week and WOW the recent design changes are fantastic. Here's more about why I can't imagine my life without Evernote. Cal: This is a new one I discovered thanks to hubby who I also converted to Any.do. iCal is the calendar tie-in for Any.do; it brings together your task list and your Calendar into one nice clean interface. I am loving this one on my phone because it displays both my appointments and my scheduled tasks in the same interface. And it's so much cleaner than Google Calendar on mobile. 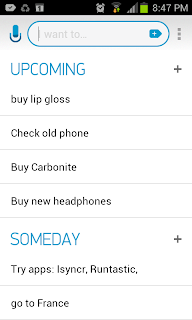 In fact, it reminds me more of Google Now Cards. Coffitivity: This one I just discovered this week. I work in a shared office: there are 5 desks and currently 4 of them are occupied. My current office-mates are incredibly quiet most of the time; you could head the proverbial pin drop in that room on most days as all 4 of us sport our headphones. However, they are all working on the same project, so sometimes they need to meet which means I need something to drown out the conversation. Naturally, I took to Twitter to ask for white noise apps, and my colleague @pascalLaliberte suggested Coffitivity. Basically, it's coffee shop background noise. I wasn't sure about it at first, but I realized that it was perfect to both drown out the bit of conversation I could hear from my colleagues and provided the perfect white noise to concentrate. Not to mention, I think on some subconscious level it "took me away from the office" which is always a nice break. Even if it's just a suggestive break. I tried playing it on a speaker with some other music for that cafe feel, but realized that I prefer this one in my headphones, drowning everything else out instead. Do you have any apps that you swear by for productivity? What are your faves? Tweet me or leave a comment!